The Striker7.1 uses DirectX for multichannel output. 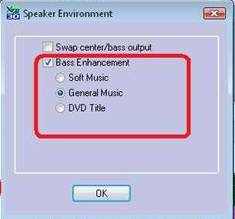 In some cases you may experience a slightly weaker subwoofer output. The Striker7.1 software includes FlexBass controls for bass enhancement and crossover frequency selection. 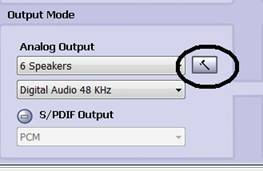 Set Analog Output to 6 (or 8) Speakers as pictured below and click the Speaker Environment option. The effects are active on Dolby Digital Live and DTS:Interactive output.